Nov. 1, 2017 3:00 p.m. Emergency department patients now have access to 24-hour family violence crisis intervention through a partnership between Red Deer Regional Hospital Centre (RDRHC) and The Outreach Centre. The new Domestic Abuse Response Team (DART) provides immediate crisis support to people experiencing domestic violence. Operated by The Outreach Centre, DART members discuss safety concerns, create 24-hour plans and provide support and referrals to individuals being treated in the RDRHC emergency department following a domestic violence incident. “I think the biggest accomplishment that we’re hoping to find is that we can link patients to the right service at the right time, so when a person is in crisis they’re offered that immediate response so they’re able to be heard and we offer them whatever support they need,” said Ronnie Biletsky, coordinator of the Central Alberta Sexual Assault Response Team and domestic violence services at RDRHC. She added only the patient truly knows what they need at that moment. Following a three-month pilot, DART has received two-year funding from the AHS Family Violence Prevention Treatment Program. To date, more than 80 referrals have been made to the DART team. “We’re actually really quite excited about being able to be very creative and innovative in providing supports to victims of domestic violence that other people don’t have, and sometimes I think it comes from when people come together and pool their resources great things can happen, and I think this is demonstrating that,” said Barb Barber, executive director of The Outreach Centre. And the program is all about the ‘now factor’, so when a patient is in crisis they may need someone to know they’re listening to what their needs are as soon as possible. “We don’t have something open at 2 a.m.” said Biletsky. Running since April 1st, Biletsky said nurses are now feeling more comfortable asking the domestic violence question, which is if domestic violence is an issue for them or their family, because before they felt like they didn’t have a lot to support them with. “Now, the nurses are going above and beyond trying to advocate for the patient, telling them about their interaction with DART,” she said adding their domestic violence statistics have increased over the last few months with having DART, meaning more patients are being asked the question. “Red Deer has consistently been going up but over the last few months. We’ve seen about a three per cent jump in the domestic violence question being asked,” said Biletsky. Barber added everything happens out of the hospital in regards to the service they provide for those experiencing domestic violence. “The call comes to the DART team, whoever’s on call at the time, from somebody from the emergency department,” said Barber. Currently, they have one full-time coordinator and seven on-call staff, who attend the hospital when there’s a referral. 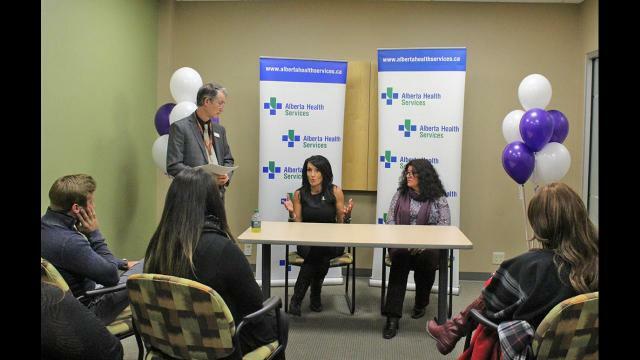 “If people are in a domestic violence situation and they’re just not sure what to do, they can just come to The Outreach Centre and we have other staff who will assist them and help them through that process and get them connected to where they need to go,” she said. The support received has been life-changing for patients such as Rebecca. The Outreach Centre provides basic needs and emotional support for individuals as well as providing education and support in specific areas such as domestic violence, family law and the effects of crisis on families. Its model is to provide families a variety of formats in which to learn more effective coping skills and options for making positive choices in their lives and the lives of their families.